Kelly Farrimond’s Poor Man’s Orange Marmalade is a reduced sugar version of his mother Doreen’s original recipe. Kelly makes it with ripe fruit off our Poorman Orange (New Zealand Grapefruit) tree as they prefer a tarter marmalade, however, if the fruit is not so ripe more sugar could be added. Slice whole grapefruit and lemons into small/medium chunks (separating and reserving pips) soaking overnight in the water. Then bring to boil for 40 minutes together with the pips wrapped in muslin cloth for easy removal. Reduce to simmer and add sugar and cook at a slow boil for 40 – 60 minutes until marmalade sets – testing by placing a small drop onto a chilled plate and give this a setting test (it should wrinkle when pushed). Remove pips in muslin cloth and discard. Decant into clean, warm preserving jam jars and when cool pour melted preserving wax on top and seal with lids. 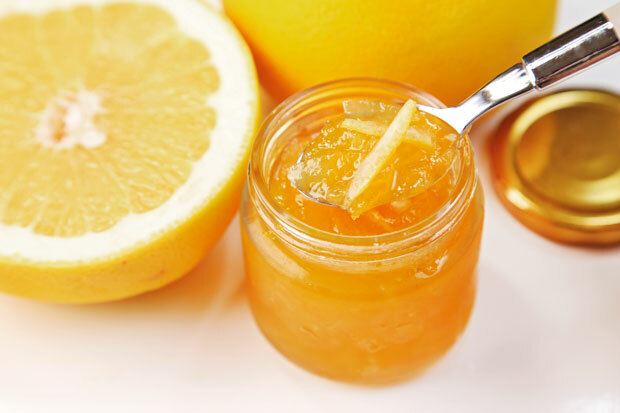 Once opened and the wax is removed, the marmalade should be kept in the refrigerator.